On Nov. 9, pharmaceutical stocks soared as Donald Trump’s election victory eased concerns about government intervention in drug pricing. Shares of Pfizer rose 8.5 percent, Allergan PLC was up 8 percent, and biotech Celgene jumped 10.4 percent. Drug distributors also gained, with McKesson up 6.4 percent and Express Scripts climbing 3.4 percent. Throughout the campaign, Hillary Clinton had vowed to take on the pharmaceutical industry and proposed various reforms to rein in drug prices, from levying fines on drug companies that imposed unjustified price increases to capping patients’ annual expenditures on drugs. Pharmaceutical stocks had generally underperformed this year as the market, like much of America, awaited a Clinton victory. In contrast, Trump generally had less to say on the subject of drug pricing, hence the market’s favorable response to his unexpected victory. Yet, as the end of the first post-election month draws near, we are still uncertain whether Trump is friend or foe to the pharmaceutical industry. Trump’s only proposal that directly affects the industry would allow the government to negotiate the prices of Medicare Part D drugs with drug makers. Although this proposal would likely have little impact on prices because existing Part D plans already negotiate prices with drug makers, there is a risk that this “negotiation” could ultimately lead to price controls imposed on the industry. And as I have previously discussed, price controls — whether direct or indirect — are a bad idea for prescription drugs: They lead to higher initial launch prices for drugs, increased drug prices for consumers with private insurance coverage, drug shortages in certain markets, and reduced incentives for innovation. Drug makers would be wise to stave off any government-imposed price restrictions by voluntarily limiting price increases on important drugs. Major pharmaceutical company Allergan has recently done just this by issuing a “social contract with patients” that made several drug pricing commitments to its customers. 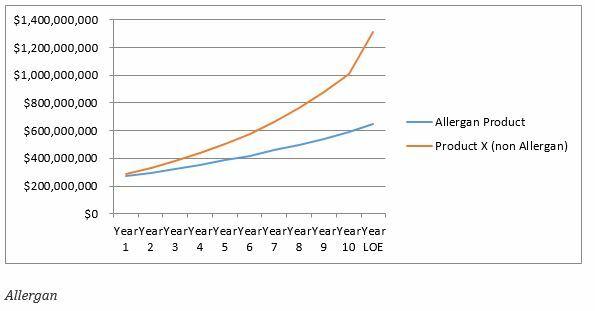 Among other assurances, Allergan has promised to limit price increases to single-digit percentage increases and no longer engage in the common industry tactic of dramatically increasing prices for branded drugs nearing patent expiry. Last year throughout the pharmaceutical industry, the prices of the most commonly-used brand drugs increased by more than 16 percent and, in the last two years before patent expiry, drug makers increased the list prices of drugs by an average of 35 percent. Thus, Allergan’s commitment will produce significant savings over the life of a product, creating hundreds of millions of dollars in savings to health plans, patients, and the health care system. The chart below shows the savings by comparing two drugs that each start with $250 million in annual sales. If Allergan can make this commitment for its entire drug inventory — more than 80 drugs — why haven’t other companies done the same? Similar commitments by other drug makers might be enough to prevent lawmakers from turning to market-distorting reforms, such as price controls, that could end up doing more harm than good for consumers, the pharmaceutical industry, and long-term innovation. Joanna Shepherd is a professor of law at Emory University School of Law.